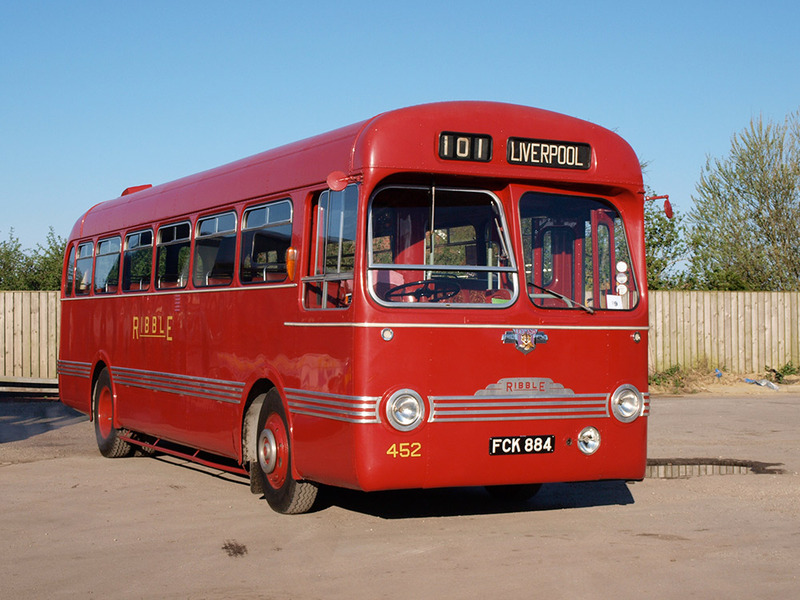 Ribble bought 50 of these vehicles in 1954 (the first 408 was delivered in 1953 and exhibited at the Motor Show). They were allocated mainly to depots that operated rural routes. 452 was converted to OMO (One Man Operation) in the mid 1960’s which meant that as well as fitting a ticket machine for the driver the rear emergency door had a glass window inserted to aid reversing. 452 seems to have spent virtually all its career at Kendal Depot (like several other vehicles in our collection). It then passed in 1968 to Lockey’s of West Auckland and was repainted into their distinctive black and white livery, being kept in immaculate condition both externally and internally. When Lockey’s withdrew it in 1979 it was purchased by a RVPT member. Restoration work began in 1995/6 and involved the vehicle having major structural work on the floor, many panels renewed, total rewiring throughout, new floor coverings, new rexine, and an engine rebuild. It was first rallied in April 1997 . It has been a workhorse for the Trust since then, receiving a full external repaint in 2013.